Adam Forrest reports that some entrepreneurs are realising the untapped potential of rivers in major cities. They envisage passenger vessels becoming a daily means of travel for residents. This would ease the pressure on congested roads and crowded public transport and help to tackle air pollution. ‘Water taxis are already plying in several British cities, including Glasgow, Spalding, Lancaster, Leeds and Manchester. In London, MBNA Thames Clippers is building a service for daily commuters (above), using Transport for London’s system which allows Londoners to hop on and off boats by swiping their Oyster and contactless cards. It carried 4 million passengers in 2016. MBNA claims its retrofitted catamarans have cut particulate emissions by 50% and nitrogen oxide emissions by 40% – but the boats are still powered by diesel. Forrest adds: “Boat operators face some major challenges. They have to be able to scale up their services to carry larger numbers of passengers, as well as trying to reduce the environmental impact of boats dependent on high-polluting diesel fuel”. In Hamburg, HADAG has added a hybrid-powered ferry to its fleet crossing the Elbe river, using both diesel and electric power sources. In Southampton, a company called REAPsystems has developed a hybrid system for water taxi boats, one able to switch easily between a fuel engine and electric motor. The company will take their hybrid water taxi boat to Venice next year, where a hotel operator will run it on a passenger route through the canals and out to the airport throughout the summer. A member of the Commercial Boat Operators Association, Antoon Van Coillie, intends to convert his large continental barges to hydrogen fuel. A team at Birmingham University (Project Leader Professor Rex Harris) has constructed a hydrogen-powered canal boat, tried and tested, which is undergoing further modifications. A minute percentage of passengers and freight are currently carried by water – but as Atkins Global (see their project ‘showcase’) asked earlier: with the rising cost and environmental burden of road transport, could UK businesses (and we add, public transport) follow Europe’s example and turn back to the water? Why get stuck in a traffic jam and miss delivery deadlines? Cut costs, cut emissions and cut fuel consumption and deliver on time on the waterways. This was one of the themes at the Commercial Boat Operators Association’s AGM at Digbeth’s Bond Warehouse. The full report may be seen here. CBOA is a trade organisation which aims to sustain and increase freight carriage on our waterways. Advantages are economies of scale and fuel efficiency, decongested roads, fewer fatalities and injuries and higher energy efficiency, producing less air pollution with lower emissions. Large loads are taken off the roads: from aggregates down the Severn, grain down the Mersey and a ‘serious enquiry’ about carrying sludge and biomass along the Leeds and Liverpool canal. CRT news reports that last June a 270 tonne electricity transformer (weighing as much as 18 doubledecker buses) was delivered to Hull and transported on the River Trent to Staythorpe Power Station. 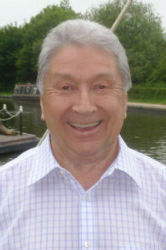 The writer had an informal exchange with Peter Mathews, the chairman of the West Midlands Canals and Rivers Trust. As he said he was keen to make links with local universities he was given three leaflets passed on by Birmingham’s Professor Rex Harris, who has worked with a team to convert a barge to run on hydrogen fuel. Ian Lane, Waterways manager (WMCRT), came for the last hour only, but whilst walking back to city with him it emerged that both have many creative ideas – some centring on the new Icknield Port development. The first speaker was Antoon van Coillie of Blue Line Logistics, Belgium. 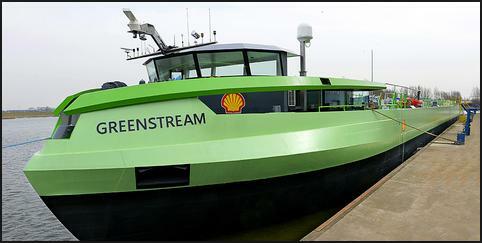 This dynamic entrepreneur said that in due course his company’s barges will transfer to hydrogen fuel. An umbrella organisation, Inland Navigation Europe, promotes waterway transport in Europe: “After all, why get stuck in a traffic jam and miss deadlines when you can cut costs and deliver on time on the waterways? 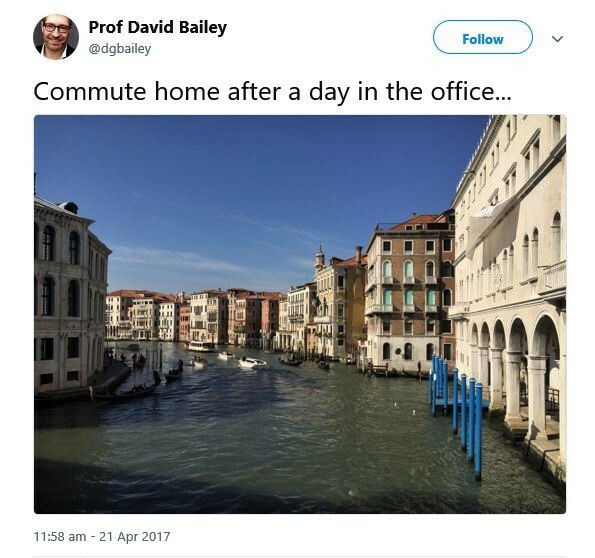 Increased waterway traffic is so important because it is not only cost-effective, it also makes for a more sustainable transport network. INE strongly believes in the innovation power of waterway transport, both in terms of organisation and technology: “On new ships, air emissions such as NOx and PM are also radically decreased. The same development is expected soon for existing vessels . . . Next to optimized propulsion and dual fuel LNG vessels, we see the first vessels emerging that run on hydrogen and electricity”. The second speaker was Dr Tom Cherrett, University of Southampton, who described plans to set up a floating depot (dummy barge) like those in Amsterdam. 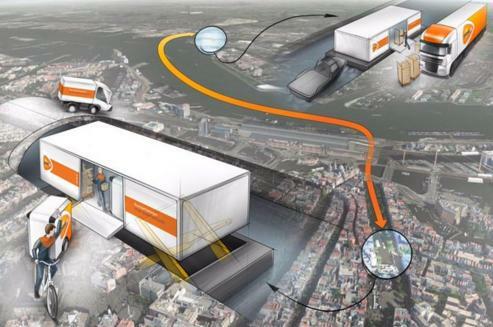 A floating depot will be used by TNT for collecting and delivering parcels in the city centre. It will be moved by boat using the canal network and small electric vehicles will undertake the last-mile deliveries. Dr Cherrett is one year into a three-year project for the floating depot which is designed to reduce the impact of freight and service trips. 24 partners are on board. The third speaker Steven R. Mears, is a senior naval architect with Keel Marine Ltd, which designs all types of craft and trades worldwide. They are moving towards designing hybrid power systems which offer motors/generators running at optimum efficiency/emissions. 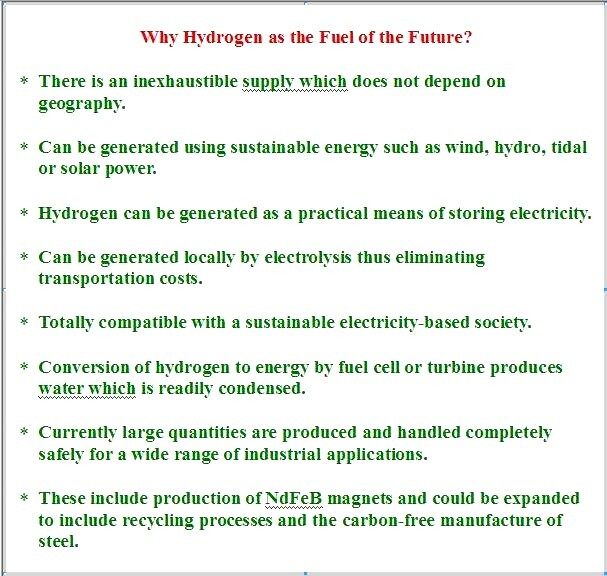 This provoked quite sharp questioning from two audience members as to why they were not ‘going for hydrogen’. Mr Mears sees the adoption of hydrogen fuel cell as being ‘some way off yet from being low cost and readily available’, adding that ‘LNG and hydrogen means the tanks take up lot of space’. A small team set up the Protium project which applies new technologies (eg solid state hydrogen stores, permanent magnet drives) to a traditional mode of transportation, in a practical demonstration of how to redress atmospheric and fresh water pollution and resource depletion, by long term sustainable means. Because this is an inherently efficient mode of transportation, the use of hydrogen in this context is expected to become commercially viable at a much earlier stage than in automotive applications. Many of the readers who enjoyed reading an earlier post, The Ross Barlow: a zero-emission hydrogen hybrid canal boat, will be interested to read that Professor Rex Harris, University of Birmingham, later gave a Lunar Society Boulton and Watt Commemoration Lecture. He talked about hydrogen, rare earth magnets, sustainability and the role of the city and region, past, present and future, considering two major threats facing our planet: resource depletion and climate change. Both operate on similar timescales and both require urgent remedial action. Rex explored the challenges that face society in identifying solutions that reduce the seemingly inexorable rise in CO2 emissions, and which of these make the most of our sustainable energy sources. He drew upon his own research on hydrogen and magnets and demonstrated that they are essential partners in any life-saving drive towards a sustainable society and showed why Birmingham and its environs could play a pivotal role in the implementation of carbon-free technologies by building upon its manufacturing and engineering history and creating a much needed manufacturing renaissance. A copy of the 150 slide powerpoint presentation can be found here. View the highlights of Professor Harris’ Lecture here or the full Lecture, here. Professor Harris is currently Honorary Professor of Material Science at the School of Metallurgy and Materials, University of Birmingham. For around 40 years, he led the Applied Alloy Chemistry Group (AACG) in Metallurgy and Materials. During this time he maintained a long-standing research interest in the fields of rare earth alloys, permanent magnets and hydrogen purification and storage materials. He developed a close synergy between these fields with the development and application of the Hydrogen Decrepitation (HD) process to the manufacture of NdFeB magnets. The HD process is now used world-wide as the standard means of production of these materials. Hydrogen, Magnets, Sustainability and the Birmingham Connection . Readers who enjoyed reading about an earlier post,The Ross Barlow: a zero-emission hydrogen hybrid canal boat, will be interested to read that Professor Rex Harris, University of Birmingham gave the Lunar Society’s 2011 Boulton and Watt Commemoration Lecture. Professor Harris explored the challenges that face society in identifying solutions that reduce the seemingly inexorable rise in CO2 emissions, and which make the most of our sustainable energy sources. A copy of the 150 slide powerpoint presentation can be found here. View the highlights of Professor Harris’ Lecture here or the full Lecture can seen here. Professor Rex Harris is currently Honorary Professor of Material Science at the School of Metallurgy and Materials, University of Birmingham. For around 40 years, Professor Rex Harris was leader of the Applied Alloy Chemistry Group (AACG) in Metallurgy and Materials. During this time he maintained a long-standing research interest in the fields of rare earth alloys, permanent magnets and hydrogen purification and storage materials. He developed a close synergy between these fields with the development and application of the Hydrogen Decrepitation (HD) process to the manufacture of NdFeB magnets. The HD process is now used world-wide as the standard means of production of these materials.